Prepare for any kind of weather on your big day. You can't control everything about your wedding day, especially not the weather. But that doesn't mean you can't plan ahead. One weather worry you shouldn't stress about? Wind. According to the pros, it can actually be a gift from Mother Nature. "One of the biggest tools used on set for photo shoots are fans and dryers to mimic the wind and make the hair move," says hairstylist Rodney Cutler, owner of Cutler Salons. "Use the wind to your advantage on your wedding day." Take his words to heart and don't lose sleep over the chance of wind on your big day. 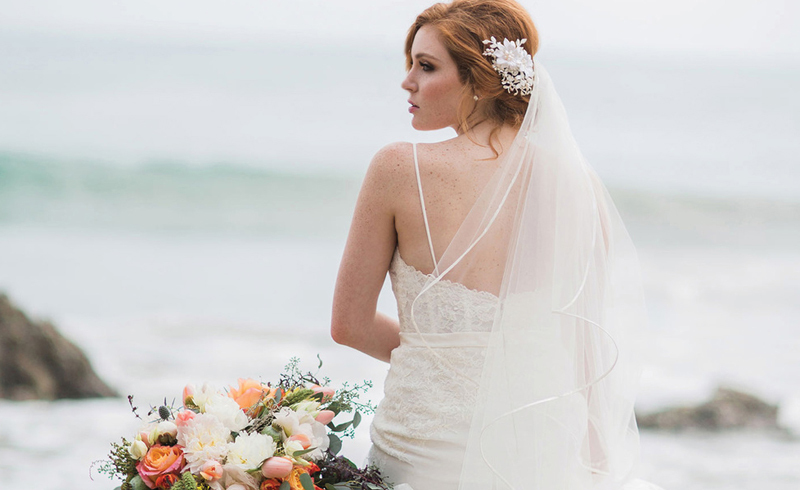 To help you prepare for a strong breeze on the wedding day, Cutler and makeup artist Elena Miglino, a Smith & Cult Beauty Ambassador, explained how you can work with the wind (not against it!) to create a gorgeous wedding-day look that will last from the ceremony to the reception. Choose a hairstyle that will be enhanced with the wind. "Loose updos or wearing your hair down—anything that looks good with movement—will work best if there is some wind," Cutler says. "These styles can also be easily touched up if there are stronger winds. If you try to fight against it with a super sleek look or a tight updo that relies on perfection, you'll create unnecessary stress for yourself." He adds that the key to perfect wedding-day hair is not having to worry about it, so go with something low maintenance that won't require tons of upkeep. All styling products you use should be light and flexible. Just like the style, your hair products should work with the wind, Cutler says. "A common mistake is fighting the elements by relying on strong-hold hairsprays or mousses to keep hair in place, which ends up making the hair look heavy. A better solution is to use products that embrace a beautiful windswept look." One of his favorites is Redken Wind Blown 05 Texturizing Spray, which has a light hold and makes hair seem as if it has been swept by the breeze. No matter which products you and your stylist choose to use, make sure they allow your hair to have some movement. Keep bobby pins the same color as your hair on hand. If you're worried about hair getting in your face on a windy day, Cutler offers this surprisingly simple piece of advice: Use strategically-placed bobby pins that match your natural color to keep your hair in place. They won't distract from your style and you won't even notice they're there. "You never want to apply too much moisturizer because the makeup won't hold all day—and it might make your hair stick to your face," Miglino says. "I always tell my brides to get a hydrating facial before the wedding. It makes the skin glow, and you don't have to worry about dry or cracked skin." To prevent redness from wind burn, she recommends a bit of Avène Eau Thermale Hydrance Rich Hydrating Cream. "I stumbled upon this gem one day in Duane Reade and have never looked back. It helps to soothe and repair all the harmful things weather does to our skin." Keep hair from sticking to your lips, too. That means steering clear of anything too sticky. "My favorite lip product for a bride is Smith & Cult The Tainted Lip Stain in Kissing Tiny Flowers," she says. "It's a matte lip, but never appears dry—it has this gorgeous finish. It's basically lip color with a little depth." Wear individual fake eyelashes instead of strips. You never know when a strip can take flight, Miglino says. "And individuals lashes give a much more natural look anyway," she adds. Sometimes cream blushes can pick up particles that are blowing in the air, Miglino says. Instead, try Dior Rosy Glow Healthy Glow Awakening Blush. Combat the elements with a facial spray. "I love a mini rose water spray," she says. "Sometimes harsh winds can make the skin appear dry and this is the perfect solution—it instantly refreshes the skin." You won't wear them in photos, but you'll be glad you had them on hand during your downtime. Why? "I always keep a pair of sunglasses with me for my brides when they're not taking photos," she says. "It helps to shield their eyes from the harsh winds, and helps to avoid tears."